I'm loving life these days. Few things make me happier than sun and heat and being near water, and I'm just soaking it all in as much as I can with a delicious balance of work and play. Last week I was up in Vermont cooking for a fabulous yoga retreat, and came back with a mile-high stack of new recipes and photos to share with you. 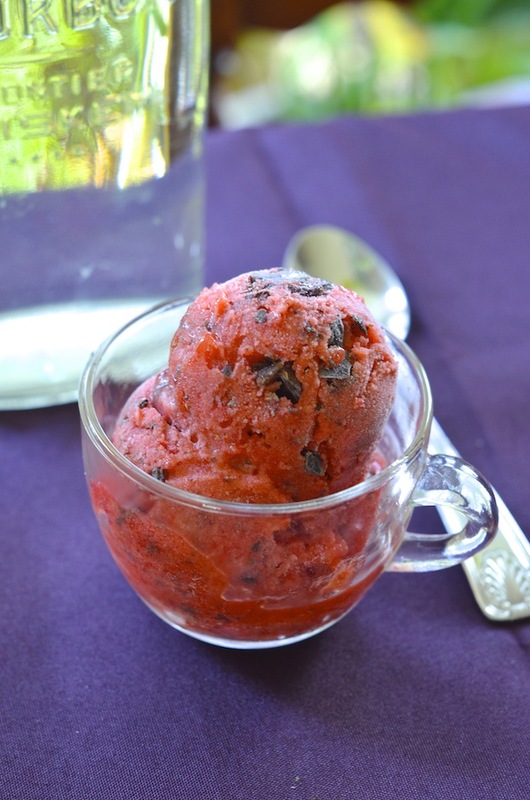 Among them was this gloriously easy Fresh Strawberry Sorbet with Dark Chocolate Chunks. It has just 5 ingredients (!!) and is the easiest thing ever to make--basically, just puree and churn! Make it now, when the strawberries are extra glorious. I swear it's like eating chocolate-covered strawberries by the spoonful. This sorbet is based on an easy method from the River Cafe in London. The trick is to puree a whole lemon (rind and all!) with the strawberries and sugar. It adds gorgeous brightness and a hint of floral to the final sorbet. I often think sorbets are just way too sweet, but this one is absolute perfection. You do need an ice cream maker for it (I use this one from Cuisinart which is less than $50! ), but if you don't have one, you can also freeze the puree in popsicle molds to make delicious ice pops! Take one whole lemon and chop it up, removing the seeds, but keeping everything else (the peel, pulp, and juice). Add all that to the food processor along with the sugar, and puree until very smooth. Juice and zest the second lemon and add to the food processor (discard the pulp, seeds, and pith from this one). Add the hulled strawberries and salt, and puree with the lemons and sugar. Pour puree into your ice cream maker, and churn according to directions. Add the chocolate chunks during the last 5 minutes of the churning process. The sorbet will be soft-serve texture at this point. Transfer to an air-tight container, and freeze at least 4 hours or until firm.